Lisa is a Waldorf homeschooling, homemaking, heart and hearth tending mother of two who has worked with parents and children for 30 years in many capacities, wearing many caps: as a midwife, Waldorf early childhood educator, parent educator, group facilitator, caregiver and parent. She has trained and served in midwifery, childbirth education, Waldorf early childhood education, HypnoBirthing and Simplicity Parenting. She has served on the board of directors for LifeWays North America and on the WECAN Birth to Three Task Force. Lisa lives with her family in rural Vermont where she gardens and cooks, looks after hens, runs a business, and strives to parent from a place of slow and simple. The month of March is when the sap starts to run from the maple trees in New England and Quebec. These forces of nature are so strong that they cannot be held back, they have been stirring deep in the arth all winter long and with the energy of spring, they come gushing forth, out of taps in the trees, filling buckets with clear sap. The sap is much like water with a hint of flavor, of a mild sweetness. When warmed, it transforms into liquid gold, a sweet, nourishing and exquisite elixir of life. Children are a bit like the sap. They experience these strong forces of nature gushing forth. We often say of the child in springtime, "his sap is running," meaning the child is full of vital life forces and energies of spring. We, the parents, we are the sugarmakers, we collect the sap with care and apply warmth, and from this wild and alomost uncontained force of nature comes something so distinct, so delectible that we lick our lips and smile with sweet satifisfaction upon tasting it. It's a bit like that with children. They gush forth and they flow, with energies as powerful as any force of nature. This month when children's own sap, those inner forces begin to run, in March, we'll gather here and explore how we can bring warmth and love and transformation to these wild forces of nature, all the while knowing the sweetness and lip smacking goodness of parenting. Do you worry about upetting your child? Do you receive so much conflicting advice that you cannot begin to make sense of it? Are you concerned about crushing your child's soul or creative spirit? Would you like to find alternatives to the use of the word no? Would you like to stay grounded in your core, your heart, that place of warmth, when you get frustrated and exasperated? If you answered yes to any of the questions above, then this eCourse is designed for you. Parenting is one of the hardest tasks, if not the hardest task we do, and we are not warned before hand! Most of us are completely unprepared for the relentless transformation that comes with parenting. We tend get little support and too much criticism and unsolicited advice in what can be a delightful and hard task, with lip smacking goodness and extreme frustration. This month we deepen our focus on rhythm to see how a healthy rhythm with limits and boundaires eliminate stress and frustration and bring more peace and calm to your home. My approach is to encourage you through exercises, reflection and discussion, to tap into the awareness, creativity and skills you already have to find creative and connected ways to be with your child in a more harmonious manner, on a day to day basis. This course supports the healthy whole child and whole parent and does not suggest the use of coercion, manipulation or force. I bring gentle, peaceful and positive parenting approach that is grounded in the my Three C's Approach to wholisitc parenting: Consciousness, Creativity and Connection. A healthy and dependable rhythm is one of the most valuable gifts we can give to ourselves, our children and our familes. A good rhythm creates spaciousness of time and peace of mind. Rhythm is often defined in terms of a sequence of events through the day. Yet there is another aspect to rhythm that is very helpful in daily life with children. 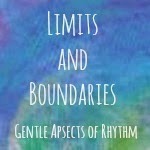 That aspect is the gentle use of limits and boundaries. Think of rhythm as a spectrum with complete chaos on one end and unbending ridigity on the other end. What lies inbetween is the realm of limits and boundaries. The realm of limits and boundaries is one that is not laid out for us as parents. We may find our approach to parenting is different from our parents, yet we may not always feels clear about what it is. We may know wth clarity what it is not. This course will help you clarify your values and learn how to bring comfort, security and healthy attachment to your child through an exploration of the benefit of gentle and loving limits and boundaries, that you define, to create a calm and maningful home environment. If you are a teacher or care giver and would like support on how to go about bringing creative and connected change in a group when a children or children seem to be out of control, this course will help you. During the four weeks of March, we'll take up our mantle of warmth to explore ways in which we can bring gentle, loving, positive boundaries to our selves, our home life and our children and feel good about it. Peaceful living comes out of healthy boundaries. Join us to explore your relationship to limits and boundaries along with gentle and positive ways to bring them to your life with children. We'll explore sibling squabbles, children who have experienced trauma and the Alpha child. If you'd like to have more practical skills in parenting to bring calm and peacefulness to your home, using conscious, creative and connected parenting, this eCourse is for you. What do I need for this eCourse? How much time do I need to spend on line each day? Daily check in for 5-15 minutes is ideal. What if I skip a day or several days? That is fine, just go back at your pace and check in on the days you missed. Do I need to be available or online at any specific times? Not at all. If you can check in once a day, for 5-15 minutes, that is plenty. You will have access forever, indefinitely. Is it all on one site? How easy is it to access? It is all on a private site that is very easy to access and navigate. Who sees the comments and discussions? Only the members of the class. If you offer this class again, will the new members see this course? No, this course is only for the current members. When I offer it again, it will be on a fresh site. Do I have to participate and comment each day? Participation is voluntary and you are free to speak out or not. I notice that the more class members participate, the better the class is for everyone. The real work is in bringing the daily notes and suggestions into your day and applying them. Where do I sign up and how much does it cost? It costs $25 , yes it is truely a bargain!